The local Labour Party-controlled council gave the go-ahead for its demolition, the day before a planned demonstration and in blatant disregard for the historical significance and beauty of the artwork. Local opposition expressed in an online petition attracted thousands of signatures in less than a month. In fact, the mural was situated in an underground walkway leading to John Frost Square, named after one of the Chartist leaders in Wales and a couple hundred metres from the main fighting that took place at the Westgate Hotel. 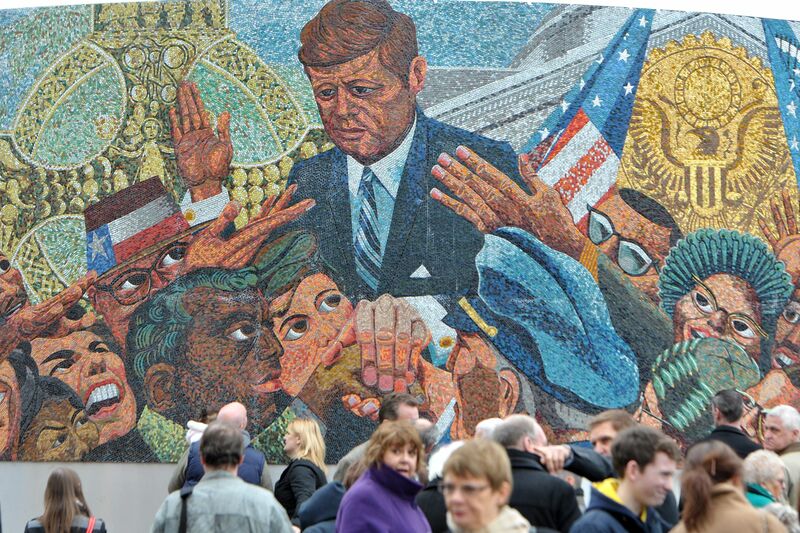 The architectural and artistic significance of the mural, produced by Kenneth Budd (1925-1995), was explained to the World Socialist Web Site by his son, Oliver, also a mosaic artist. Budd said that several of his father’s other works had also been demolished. These include some of those produced during the redevelopment of the UK’s second largest city, Birmingham, in the 1960s—the English Civil War (Battle of Birmingham, 1643), the J. F. Kennedy Memorial and the Colmore Circus Industrial mural. That Newport City council pressed ahead regardless of the mosaic’s destruction is linked to a number of factors. Increasingly, cash-starved councils are handing over control of city centres and their public spaces to private companies whenever redevelopment takes place—as in the case of Cabot Circus in Bristol and Liverpool One, which covers 34 streets in the heart of Liverpool. Newport, which has the highest number of closed High Street shops per head of the population of any city in Europe, is going down the same route. Anything that detracts from the pursuit of profit is swept away. Rules and regulations are enforced by uniformed private security officers amid round-the-clock surveillance. A host of activities such as cycling, rollerblading, taking photographs and political protest are banned. The Occupy movement in London, for example, ended up camping on the steps of St. Paul’s Cathedral because Paternoster Square, in which the stock exchange was located, had been privatised a few years before. However, the Newport mural’s destruction is in large measure due to its symbolic significance to the developers and the Labour Party. The Newport Rising, on November 4, 1839, a few months after Parliament had rejected the six-point Charter calling for voting reform, was the last major armed rebellion in mainland Britain. As the Times of the day reported, several thousand Chartists had marched from across South Wales into Newport. Sources suggest they were demanding the release of fellow Chartists imprisoned in the Westgate Hotel. When they surrounded the hotel, troops and special constables fired on them, leaving 22 dead and many more wounded. The Chartist leaders, including Frost, were convicted of high treason and sentenced to be hung, drawn and quartered. But after protests from all over the country, the sentence was reduced to transportation for life. Other uprisings were also planned in Sheffield, the East End of London and Bradford. “The era of Chartism is immortal in that over the course of a decade it gives us in condensed and diagrammatic form the whole gamut of proletarian struggle—from petitions in parliament to armed insurrection.… As the Chartists tossed the sentimental preachers of ‘moral force’ aside and gathered the masses behind the banner of revolution so the British proletariat is faced with ejecting reformists, democrats and pacifists from its midst and rallying to the banner of a revolutionary overturn,” Trotsky explained. This is precisely why big business and a party committed to the defence of big business, Labour, was so keen for the mural to be destroyed.